Q. How do I find biographical information in encyclopedias? On the Library homepage, click on Databases A-Z in the center of the page. 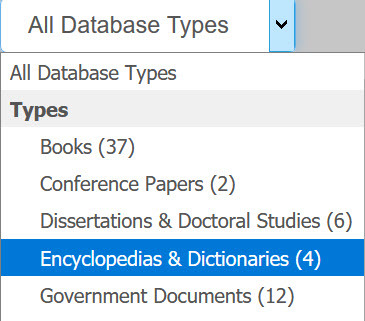 Click on the All Database Types box and select Encyclopedias & Dictionaries from the dropdown menu. Enter your user name and password if prompted. Type in the name of the person and click the search button. On the results page, click the title of the result to go to the full entry.